If you approached a group of surfers and asked them to pitch ideas for an opening ceremony for a surf festival, you might get the following: loud music, the cliché Aloha shirt, good grinds and several kegs of beer or a limitless bar tab. The Opening Ceremony of the inaugural Hainan Wanning Riyue Bay International Surfing Festival Presented by Quiksilver didn’t quote fit that picture. In a country with very little surf culture to speak of, no expense was spared and countless hours were exhausted in order to present a ceremony so dynamic in scope and so far beyond anything that’s ever launched the beginning of a surf contest, that you couldn’t help but step back, have a small laugh and be left in awe of it all. Sands from beaches around the world are brought together in a regular ISA tradition. "Even in my dreams I couldn’t have foreseen an event of this magnitude," said Fernando Aguerre, the President of the ISA, who sat side-by-side with a high-ranking official from the Communist Party of China at the ceremony. "Surfing has captured the hearts of so many people around the world. We hope it will capture the hearts of the Chinese people and continue to grow in this country for years to come." Early on in the Festival, the concern won’t be whether or not the Chinese media and public will be captivated, no, that’s a given, the concern is how will the next host country match or surpass what has been presented. Large-scale choreographed dances, including as many as 50 performers at a time. Musical performances by some of the country’s top artists. A gourmet buffet dinner for 400 guests. A major firework display fit for the Fourth of July. And an unscripted capoeira demonstration by members of the Brazilian team. "I’ve never seen anything like it in my life," said Patrick Flores, coach of Team France, after the ceremony. His son, Jeremy, had to withdraw from the ISA China Cup due to a nagging ankle injury. The day began in a conference room at the Le Meridien Hotel with the press conference, which was attended by more than 50 Chinese media persons. There, the man with the original vision shared his story. "This is a 3-year process that has finally come together – it’s more of a dream really," said President Aguerre of the eight-day Festival. 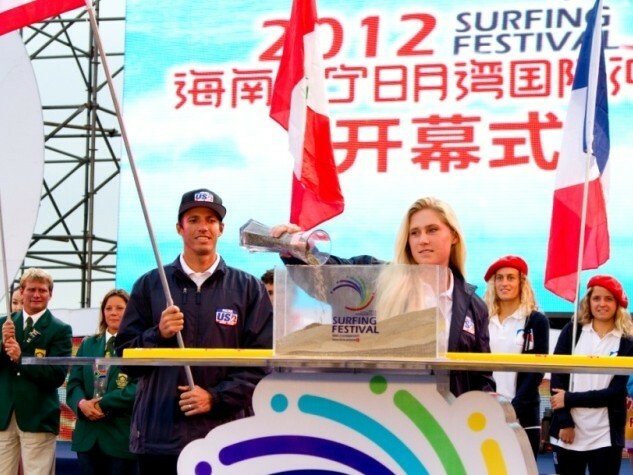 "We are bringing surfing and the aloha spirit of the sport to China." At the press conference, Mr. Luo made the future intentions of the city of Wanning clear: he wants the city and the island to welcome and embrace the surfing culture and make it its own – beginning with making the event an annual happening. 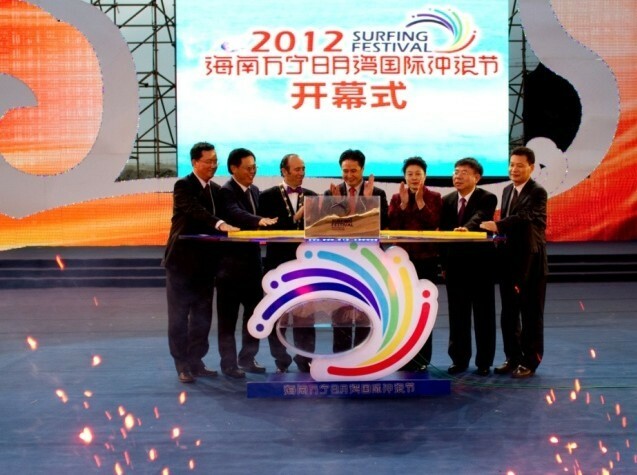 While the press conference served as a declaration of a commitment to surfing, the ceremony served as the celebration. From the first dance performance to the final performance, when surfers joined the dancers in a traditional bamboo dance, the message was sent: Aguerre’s dream is officially a reality. Competition begins Sunday morning, and the lefthand pointbreak at Riyue Bay is expecting an increasing swell over the next couple of days. "I never thought I’d be competing in an event in China," said Pauline Ado, who competes for Team France. "With everything that’s been put into the event, I’m very honored to be a part of this historical happening."